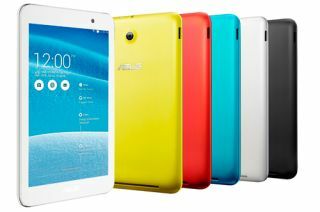 Asus launches "new generation" of Android tablets | What Hi-Fi? Taiwanese manufacturer ASUS has chosen the Computex technology conference in Taipei to announce the launch of its "new generation" of Android tablets. The "innovative" new line-up of portable devices includes the latest edition of the firm's MeMO Pad (above), with all of the new models running on Android 4.4 KitKat. Available from mid-June, the new ASUS MeMO Pads boast the 64-bit Intel Atom Z3745 quad-core processor up to 1.86GHz for "powerful, efficient performance". The ME176C and ME181C models come with Miracast support that'll allow you to stream your multimedia content to compatible external displays. There's also aptX Bluetooth support for streaming music to compatible headphones and speakers for superior Bluetooth sound. Meanwhile, the ME581CL version of the MeMO Pad 8 features an 8in, 178-degree wide-view, full HD 1920 x 1200 display and wi-fi, 4G and NFC connectivity. Elsewhere, the ASUS Transformer Pad (above) includes a mobile keyboard dock and LTE capabilities designed for "high-quality video streaming" among other functions. Like the new MeMO Pad, you can choose between a 1280 x 800 HD display or a full HD 1920 x 1200 display on your new Transformer Pad with two versions launched. There are also two models of the new Fonepad series (above), which aim to combine a 7 or 8in device with 3G phone functionality. Both come with a 1280 x 800 display. Meanwhile, there's the new Transformer Book Flip (below) – described as an "affordable" Windows 8.1 laptop with a hinge design that lets you set the screen at any angle. It boasts a Full HD 1920 x 1080 touchscreen display and ASUS SonicMaster audio, which the company says has larger speakers and resonance chambers than similar laptops. The Transformer Book Flip also comes with 2GB of video memory to provide "enough graphics power for smooth video playback" and is expected to be available from late June.